NLB flex lances make pipe and tube cleaning a breeze, snaking around bends to remove even hardened deposits. We offer a wide range of diameters and connections, in pressures of 10,000 psi, 20,000 psi and 40,000 psi (700, 1,400 and 2,800 bar). 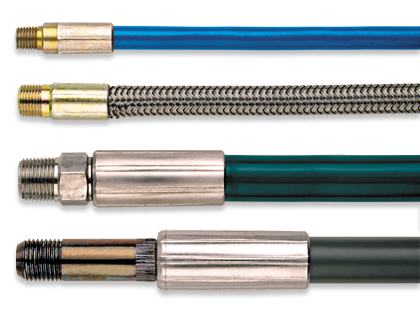 Flex lances are available with abrasion-resistant RP hose (nylon cover also reduces friction) or kink-resistant SRV hose (2 spirals of high-tensile, stainless steel wire). Our UHP flex lance is reinforced with 6 layers of this wire.